The beginning of a week brings a new Music Monday post here at Gleeks United! This week we’ve got guest blogger Joanna back again because she did such an awesome job last week! Joanna is a British gleek who runs the lovely blog At Home with Mrs M, and a few weeks ago she even did her own post on what songs she’d like to see on Glee (which you should check out here)! This week, Joanna’s pick is “Out Here On My Own” from the musical Fame, originally performed by Irene Cara, a song she thinks would be perfect for Quinn. Check out the song below, and read on to see why this tune would be a perfect one for Quinn to sing her heart out on! When I heard this song, I thought of Quinn and how being in her situation, she must feel so alone and vulnerable. She’s lost her boyfriend and is no longer part of the Cheerios, her parents have disowned her and her life as she knew it has completely changed. Deep down I think Quinn is a strong person, and I’d like to think that she will draw strength and come back fighting! A bit like Finn singing “I’ll Stand By You” to the sonogram, I imagine Quinn thinking of her unborn daughter when she sings this. 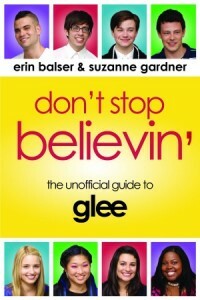 It’s a powerful song and I’d like to see Quinn belting it out! Thanks for guest blogging on Music Monday again this week, Joanna! Do you have a song that you keep imagining being performed on Glee? E-mail me at suzie.gardner@gmail.com and you could do a Music Monday guest post!